Rides aren’t all carefree and fun like yesterday’s. I knew when my trainer said that I now ‘need to start riding back-to-back days’ for racing training that it wasn’t going to be easy. Hell I even knew it would probably be hard. But I wasn’t expecting this. I heard last night that there wasn’t to be an intermediate group at the Bristol South Clubrun today. Not ideal for my first back-to-back riding weekend this year but I wasn’t going to let thwart my plans. No siree. We headed out as one group, and this very quickly split into two groups as we pumped our legs out of South Bristol up Dundry Hill. I was therefore in a lovely situation – should I pick the group that’s too slow for me or the group that’s too fast for me? No question obviously. I was in for a tough day. 12 or so male ‘speedsters’, and me. On the gentle rolling straights I was neatly in the group, but I was working hard. 18-20mph in the most part on these sections, guys at the front chit-chatting away with their honed slim thighs doing all the work with seemingly not a huge amount of brain power needed. I was conversely focused intensely on keeping up, over the fifty miles barely a minute of mental down time. This is a shame because there’s a lot of beautiful scenery to look at in the Mendips, but I showed up today because I wanted to train and a training ride this definitely was. We stopped at Heather’s (not before a second mighty meaty ascent up Harptree East), a cafe in Congesbury where upon approach there was chatter of carrot cake. And so carrot cake it was. 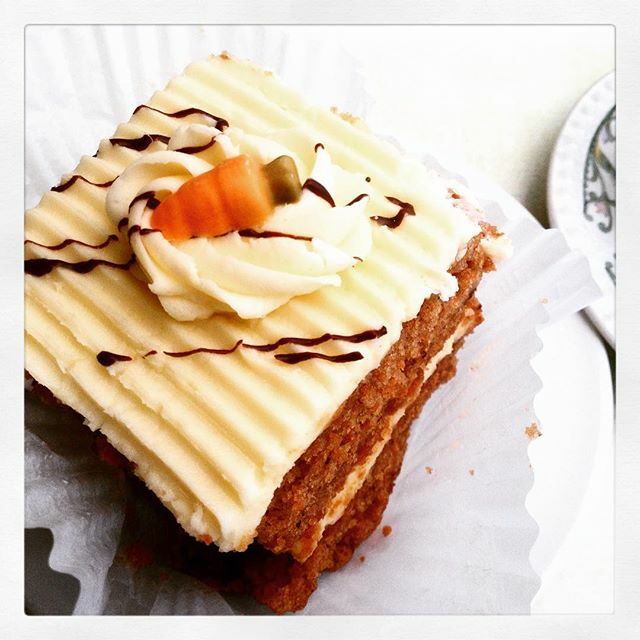 And oh my, what a carrot cake! It was enormous. For some reason I decided to polish it off. Upon departure, a decision I immediately regretted. It sat heavy in my stomach, mocking me in its carroty way, and the speedsters weren’t letting up any. Wind attacked, grinding through it, everyone passed me. The long sweeping descent down Burrington that followed was most welcome. But the hardest part was to come. A hill by the name of Naish was it’s name-o. Ohh. This is notoriously rough even without 40 miles of hills preceding it. I couldn’t believe what was before my eyes. A category 4 climb with a 20% gradient awaited my tired legs and groaning stomach. In the middle, (you know, around the 20% bit) this weird thing happened. Boys long gone, I stopped, traffic chugging uphill past me. I haven’t had a genuine and immediate urge to get off my bike and walk, ever. Until today. I unclipped, put my foot down and my head graced the handle bars. I just had this intense feeling of awareness of masochism, in the sense that I was asking myself the following question: in what part of my brain do I think that experiencing this sort of great discomfort is good fun? I took a deep breath, pondering, clipped in again and continued upward, at around 3mph, tears on cheeks. I haven’t even mentioned the bit where I vomited that cake today, but that happened too. Classy bird I am. “If you’re not pushing yourself beyond the comfort zone, you’re denying yourself an extraordinary trip.” – Ultra Runner Dean Karnazes. The rest of the ride back was fine after a deep breath to regain composure at the top. But suffering on Naish reminded me how it used to feel when I first started road cycling. Now and again I have little glimpses into how it used to feel for me on a regular basis – and by going back for more helpings, I’ve increased my threshold for suffering and thus increased my capacity for enjoyment. They remind me how far I’ve come. But now and again it hurts. I’m still pushing, still improving. I think it’s really important to balance these really challenging rides with easy, chilled, shorter, chatty ones, even though they don’t earn you any points on the suffer scale (that’s an actual thing). Because being able to look up and breath in the view is (mostly) what’s it’s all about, after all. Damn, that post-ride bath was good. BSCC stopped and waited for me (and others) several times today. They were good company and supportive. There is usually notably more women as BSCC rides in my experience than with other clubs, and they are very female friendly. They usually have three groups, ‘slow’, medium and fast. Clubruns go from 8.30am every Sunday morning from Bristol Bridge. There’s usually cake. To find out more, visit the website. Kit Review: Fierlan Thermal Jersey.